Stern is failing to address a chronic issue on this game -- the Vengeance plastic -- that oddly they address with a Service Bulletin on Guardians of the Galaxy Pros, and eventually mid production. On Guardians, the plastic above the Orb shot can shatter as a result of a ball striking the plastic with huge force when the drop target resets. They address this with a metal bracket that crosses over the drop target beneath the plastic. Oddly, they have not address this problem on Star Trek, which is even worse in my opinion. Both ST's I've owned, as well as all 3 I'm aware of on location, have shattered the plastic above the Vengeance Drop/magnet. The problem is that this plastic is far more than aesthetic, as it prevents balls from getting lofted and wedged between the top of the kicker coil and the vengeance ship mount. 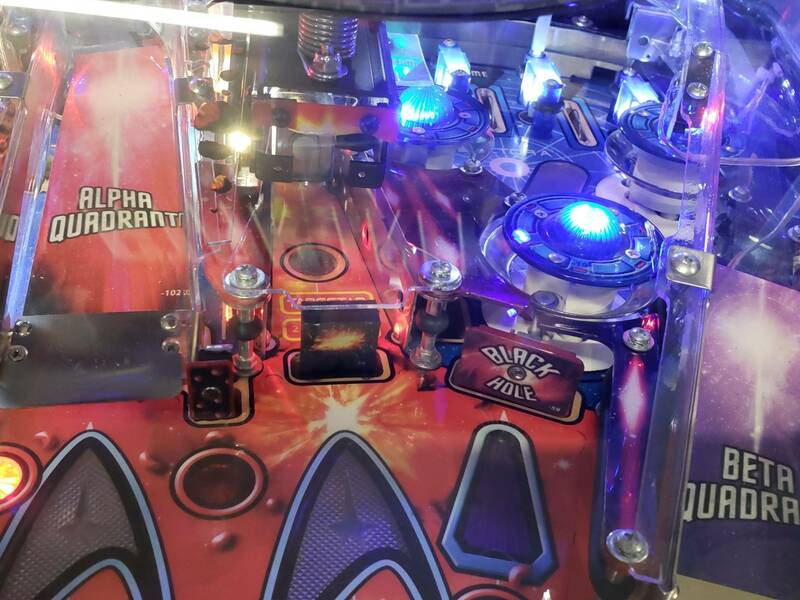 Worse yet, because of the way this plastic breaks in the center, eventually failing at the screw posts at each of the front corners, you end up with pieces of plastic doing wonders as they're dragged all over the playfield. I'm begging Stern to PLEASE release a similar metal bracket and address the same exact root problem, as the GotG service bulletin. I'm also asking any metal-savvy folks here if it would be possible to create a narrow metal cross-brace with 2 screw hole mounts, similar to the one in the above link. A very inexpensive mod (and metal strip with 2 holes) that I know would sell quite well. Example plastic after I just (yet again) replaced it. Added washers on the screw holes last time thinking that was the issue, but it's definitely the drop target. As there are two posts available couldn't a simple flat piece of metal with two screw holes suffice? If it was sandwiched between the two washers there would be a small amount of space between the metal and the plastic cover giving it a little flex room. How many times have you had to replace that cover? Yes, a thin metal strip with two screw holes would suffice. I have no metal skills or tools. This is a trivial task for those with them. I've replaced 5 vengeance plastics across 4 machines. If it was aesthetic I wouldn't care, but it's not. This needs a metal fix to take the impact of drop-target popped balls. My STLE doesn't have the clear plastic. Is that something I need to get from Stern? Nevermind, found it on Pinballlife.com. My premium doesn't have that plastic, and have never notice any issue, nor have a broken explosion plastic. Was this plastic factory standard? I wonder if it was dropped as some point: my premium was a later run.